Bio – Nikki G Ph.D.
Nikki A. Greene, Ph.D. received her BA with honors in Art History from Wesleyan University, and her Masters and Ph.D. in Art History from the University of Delaware. Dr. Greene examines African American and African diaspora identities, the body, feminism, abstraction, and music in modern and contemporary art. 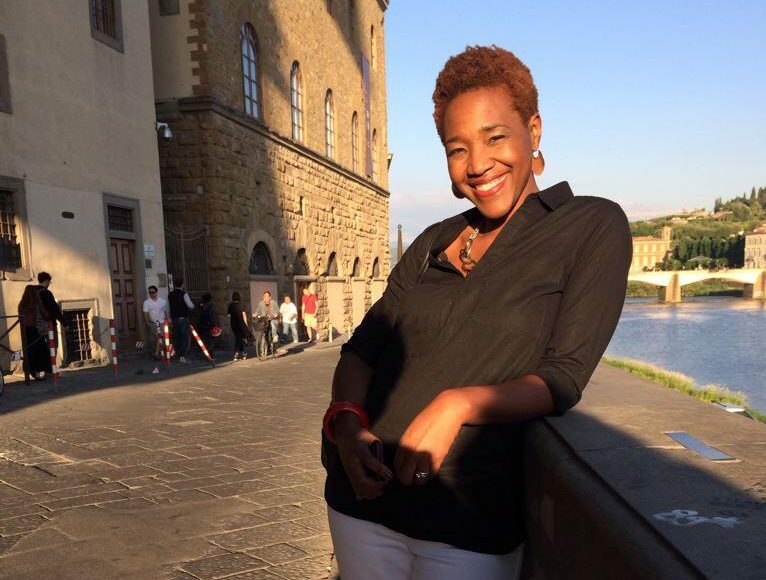 She is the Visual Arts Editor of Transition, published by the Hutchins Center for African and African American Research at Harvard University (Indiana University Press). Her forthcoming book, Grime, Glass, and Glitter: The Body and The Sonic in Contemporary Black Art (Duke University Press, under contract) presents a new interpretation of the work of Renée Stout, María Magdalena Campos-Pons, and Radcliffe Bailey, and considers the intersection between the body, black identity, and the sonic possibilities of the visual using key examples of painting, sculpture, photography, performance, and installation. She was shortlisted for the 2018 Creative Capital | Warhol Art Writers Grant. Greene’s latest publications include: “Vibrations in the Soul: Moe Brooker’s Sacred Paintings,” in Panorama: Journal of the Association of Historians of American Art (Summer 2018); “Riffing the Index: Romare Bearden and the Hand of Jazz,” in Music, Art and Performance From Liszt to Riot Grrrl: The Musicalisation of Art, edited by Diane Silverthorne (Bloomsbury Publishing, 2018); and “Habla LAMADRE: María Magdalena Campos-Pons, Carrie Mae Weems, and Black Feminist Performance,” in Beyond the Face: New Perspectives on Portraiture, edited by Wendy Wick Reeves (Giles, Ltd. in association with the Smithsonian National Portrait Gallery, 2018). Visit “Publications” for an extended bibliography. Nikki A. Greene is originally from Newark, NJ, and she lives with her husband and two children in Massachusetts. Greene’s summer 2016 blog post “Eating Ice Cream While Black (Or My Life in Wellesley, Mass)” on microaggressions received local and national attention and was featured on WBUR Boston’s Cognescenti and on Radio Boston to discuss “The Challenge of Raising Kids of Color in a Homogenous Community.” She “muses” here about her scholarly interests, travel, and the challenges of the work-life balance. “The Black Dominant Gaze in Contemporary Art.” Robert E. & Avis Tarrant Burke Lecture Series, 2019-2020. Department of Art History. Indiana University. March 2020. “Performing Missing Narratives: Representation, Diversity, and Museums.” Colloquium convened by Cheryl Finley and Dorothy Moss. The Sterling and Francine Clark Art Institute, Williamstown, MA. November 20-21, 2019. “Scholar to Scholar: Kimberly Juanita Brown and Nikki A. Greene in Conversation.” On the occasion of the “Nine Moments For Now” exhibition curated by Dell M. Hamilton. The Ethelbert Cooper Gallery. Hutchins Center for African and African American Research, Harvard University, Cambridge, MA. January 2019. Photos by Melissa Blackall. Nikki A. Greene with WBUR’s Radio Boston host, Meghna Chakrabarti. August 3: Radio Boston: “Eating While Black: Smith College Employee Reported Student Who ‘Seemed Out Of place.’” Guest appearance with Gelonnie Smith, graduate of Smith College and past co-chair of the school’s Black Student Alliance. August 3, 2018. November 15 at 6 p.m.: It is better to speak of remembering. Panel discussion for the exhibition Alexandria Smith: A Litany for Survival. Faye G., Jo, and James Stone Gallery. This panel explores the complex cultural positionality of Black female subjectivity. Approached through an interdisciplinary lens, participants will speak to the experiences and histories of Black women and how these concepts relate to themes present in the exhibition. Alexandria Smith: A Litany for Survival ~ November 8, 2018–January 27, 2019 Opening Reception: Sat., Nov. 10 @ 5:00-7:00 | Stone Gallery | 855 Commonwealth Avenue, Boston. Tuesday–Sunday from 12 to 6 p.m.